We have been in business for over 60 years! We have been in business for over 60 years and offer service to customers in Arizona, Kansas, and Missouri! Looking for Industrial, Municipal or Commercial Plumbing or Drain Cleaning? Reddi Services has been in business for over 60 years. We specialize in working with Industrial, Municipal and Commercial clients offering Tank Cleaning, Vactor Services, Pipe Cleaning and CCTV. Fundamental to the success of the company are our basic values which include quality workmanship, customer focus and commitment to excellence. We recognize that the degree of our success is in direct proportion to the quality and dedication of our employees. How we accomplish our mission is as important as the mission itself. We are committed to problem-solving at every level and have a bias for action. We delegate authority to match responsibility, expecting decision-making to occur as close to the customer as possible. We will price our services fairly and competitively, itemizing each service so our customers understand the work to be done and the charges associated with it. Looking for a reliable and professional team for Industrial Services? Reddi Services Industries is here to help and with over 60 years in the business you can trust that you hired the right company! Looking for a reliable and professional team for Municipal Services? Reddi Services Industries is here to help and with over 60 years in the business you can trust that you hire the right company! Looking for a reliable and professional team for Commercial Services? Reddi Services Industries is here to help and with over 60 years in the business you can trust that you hire the right company! 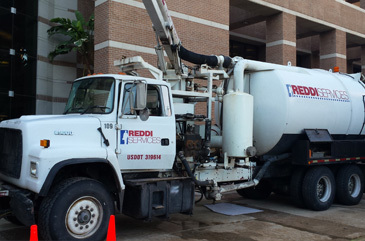 Tank Cleaning – Reddi Services provides cost effective, safe, and environmentally responsible solutions for all types of Tank Cleaning challenges. We will help you minimize waste volumes, maintain and restore efficient operations of your plant, and comply with all national and local regulations. Our tank management services include repair, cleaning, inspection, and contingency plans. Pipe Cleaning –Reddi Services offers comprehensive industrial pipe cleaning services to remove build-up and debris and restore pipe flow efficiency. 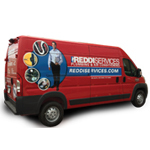 Video Inspection -Reddi Services uses video inspections via CCTV (Close Circuit Television) to inspect thousands of feet of pipes, sewer lines, and drains, eliminating guesswork. Hydro-Excavation – Also called Hydro-digging and potholing, is the process of using highly pressurized air and water combined together to dig up and remove soils at a manageable rate. While our hydro- excavation equipment is hard at work removing debris, our vacuum truck removes the material to a transport, if required. 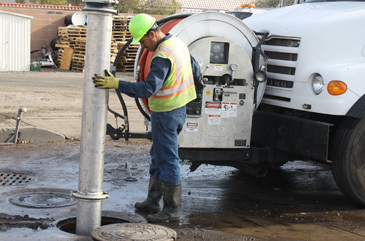 Vactor Serivces -We are able to vacuum any type of material from solids like sand, rocks, grease, roots, and other large objects to heavy sludge. Our vacuum truck is fully capable to help you with any vacuum service you may need. We recognize that the degree of our success is in direct proportion to the quality and dedication of our employees. How we accomplish our mission is as important as the mission itself. Fundamental to the success of the company are these basic values. To be an industry leader in the mechanical service, repair and replacement business through technical expertise, good business practices and superior customer services. We will base recognition, rewards and advancement on the contributions we make to our customers’ success. We have the knowledge and equipment to handle any job and offer unmatched customer service. Our technicians are all experts in their fields and are ready to help. Thank you for your interest in Reddi Services. Please contact us using the information provided below. We are proud to offer services to customers in Arizona, Kansas and Missouri.